The perfect pants for summer don’t exist, you say? Here to prove you wrong are these wide leg pants (they’re beginner-friendly!) made with Spoonflower’s Lightweight Cotton Twill and Burda Style Pattern 6966. We can’t get enough of the flowy and relaxed fit. 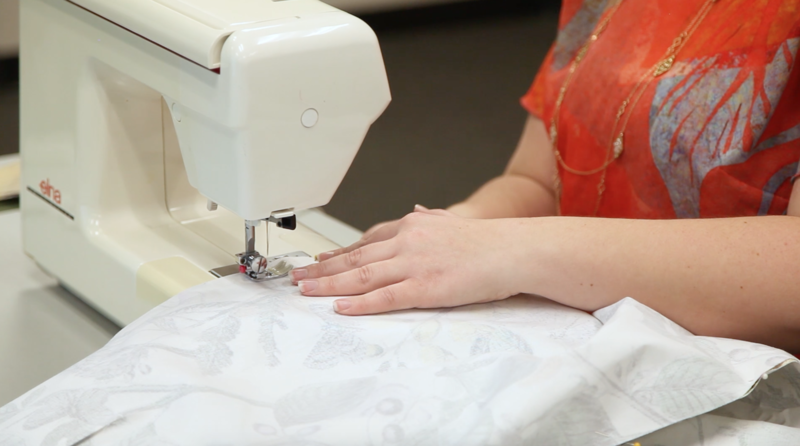 Customize with your favorite Spoonflower pattern and get to sewing with our video and step-by-step tutorial below. *Please refer to the pattern instructions to determine the final yardage needed for your size. 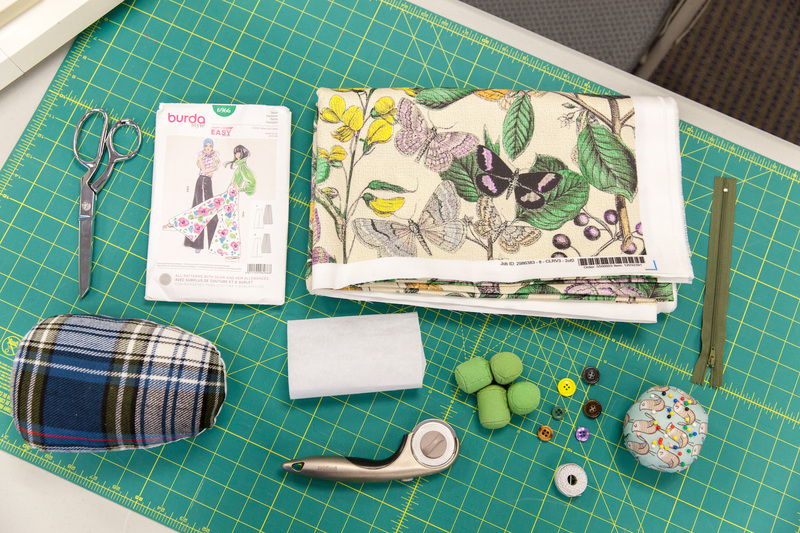 Start by laying out your fabric, pinning down the pattern pieces, and cutting them out. You should have a front leg piece, back leg piece and a waistband piece. We’re going to make a tailor’s tack with thread in a contrasting color to mark the end of the darts. 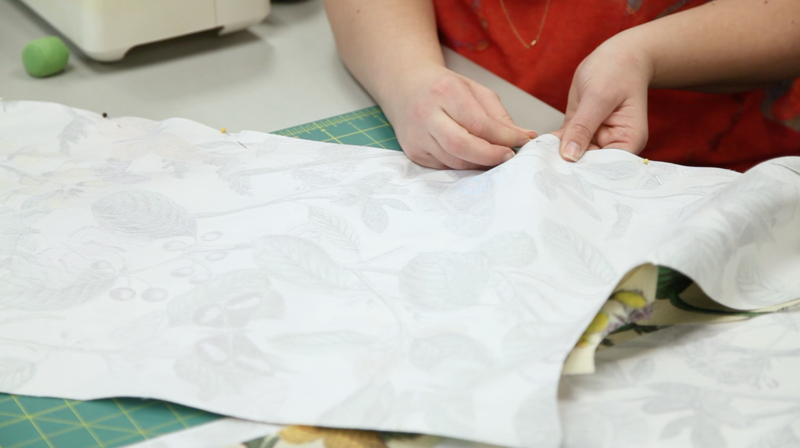 Start by matching the notches on top, smoothing the fabric down and pinning in place. We like to do everything in batches, so we’re going to pin all the darts at once, then sew them all, and finally press them. Press your dart seams so they’ll lay flat. 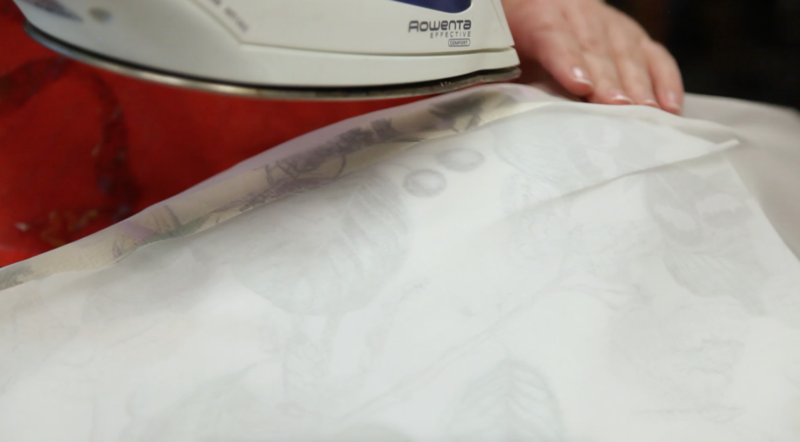 Using a press cloth and a tailor’s ham helps form the fabric to the shape of your body, since well, bodies aren’t flat! Now, we’re going to pin the front and back leg pieces together, right sides facing, matching your notches. There will be extra fabric on the back piece, since the back of your leg is larger. 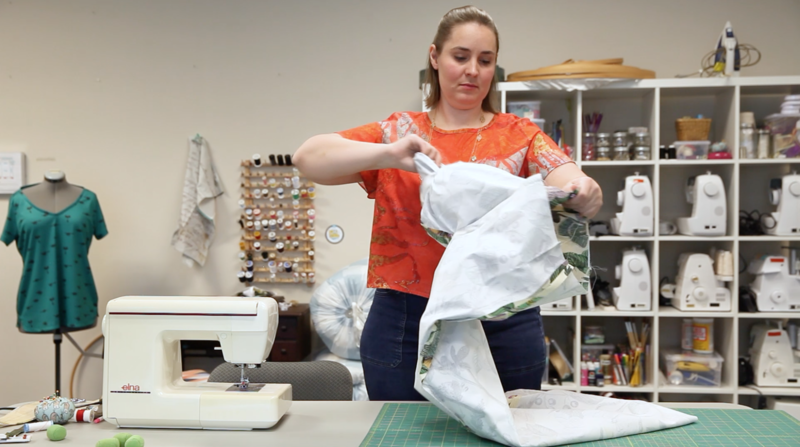 When you pin the pieces together, you’ll end up with a little bit of rolled or bunched fabric. This is ok! On the side seams near the waistband, the fabric won’t match up exactly. The front piece needs to be eased slightly to match the back inner thigh from the notches to the crotch. 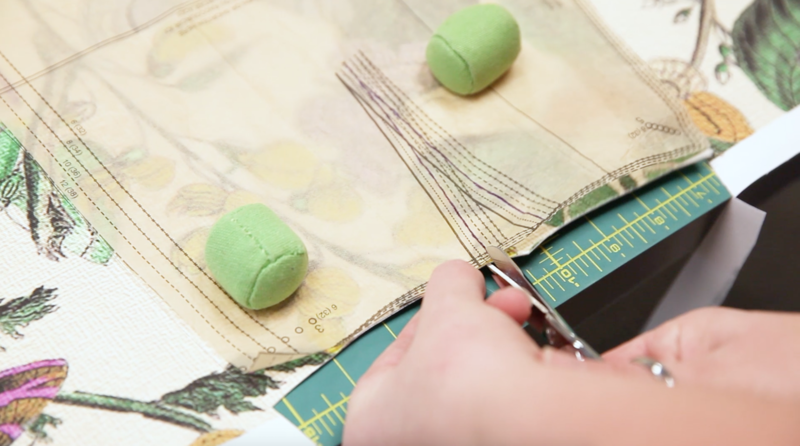 This can be done by ease stitching, or by slightly stretching the shorter section to match the longer section while you sew. 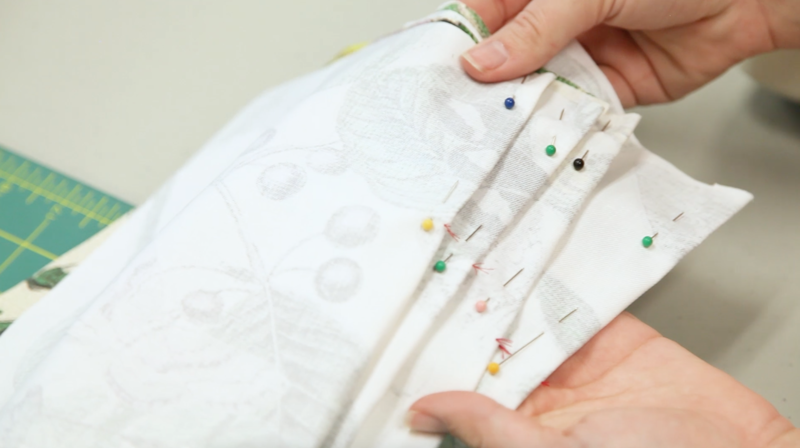 Pro tip: You want to stitch from the same direction, either all down or all up (usually it’s done from top to bottom, from the waistband to the bottom of the pants) to keep the grain from twisting. Now, we’re going to sew the side seams of each pant leg. 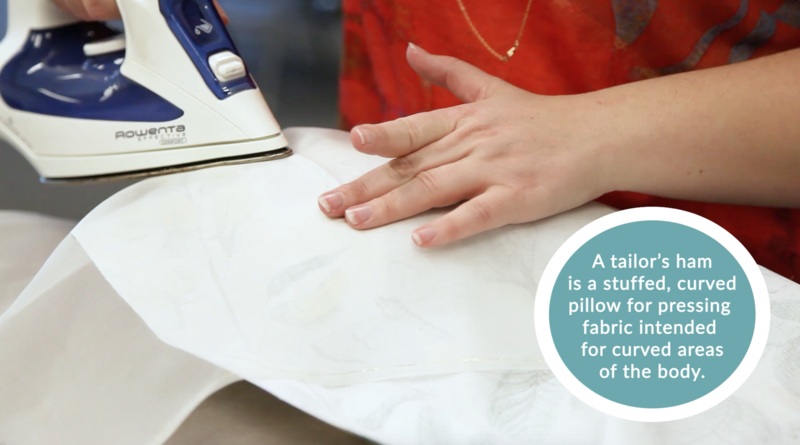 Press your seams flat. We’re going to use the tailor’s ham again around the hip area. 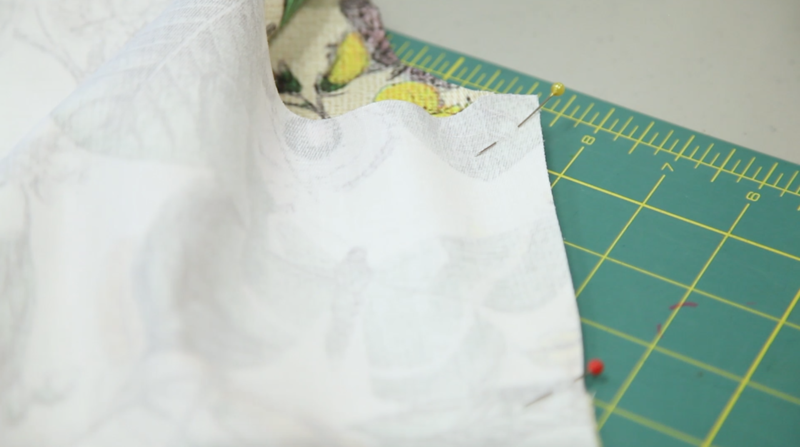 At this point, if you want to finish your seams, go ahead and do that–you could serge, use pinking shears or a zig zag stitch. Turn one of the legs right side out, and leave the other inside out. Put the legs together so the printed sides are touching. Next, pin around the crotch. There’s a notch on the back curve of the crotch–we’re going to stop sewing here, and then baste the rest of the way up the crotch curve. 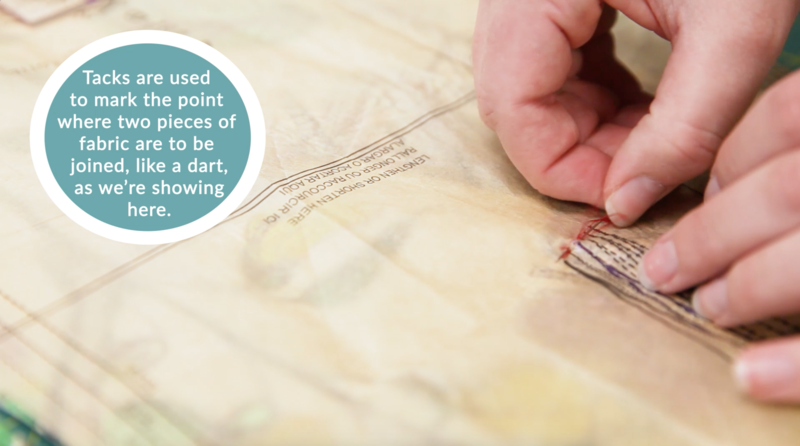 You may wish to mark the notch on the back curve with two pins in an X shape to remind yourself to stop sewing here. Go ahead and sew to this point, and baste stitch the rest of the way up the crotch. Pull the pant leg back out of the other leg. Now we have an inside out pair of pants. Finish your crotch seams and flip the pants right side out. 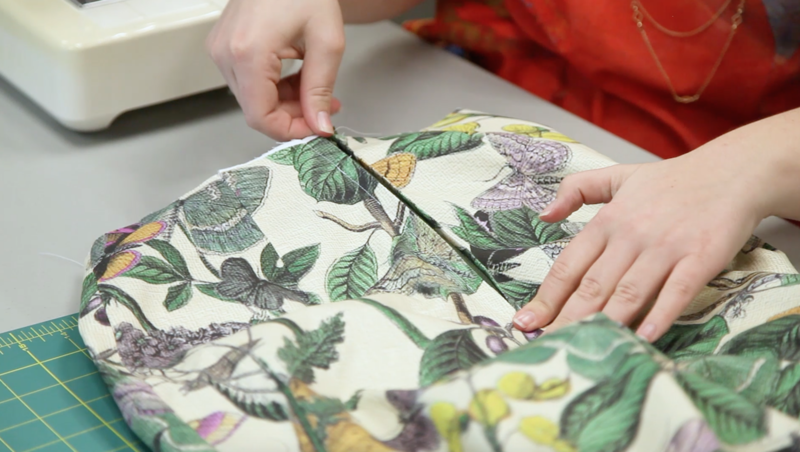 First, baste the zipper onto the fabric. 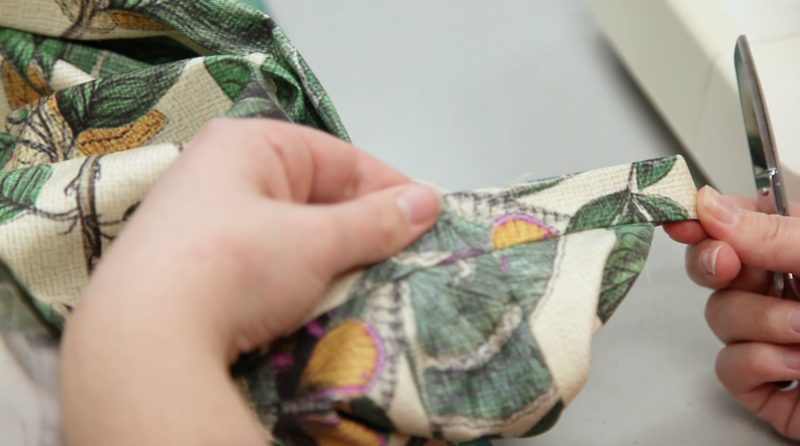 We’re going to hand baste the zipper because we find that easier, but machine basting works just as well. Now, switch to a zipper foot and sew the zipper on. 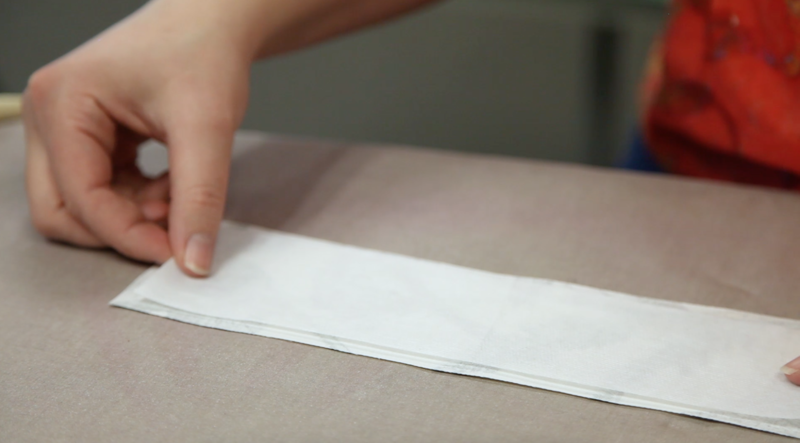 Remove your basting stitches and test out your zipper! Next, we’re going to stitch the waistband. 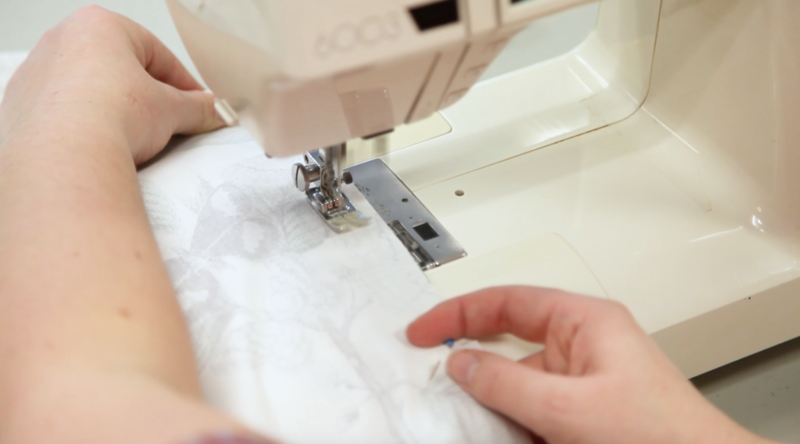 We’ve cut the interfacing slightly smaller than the fabric to keep the seam allowances from getting too bulky. 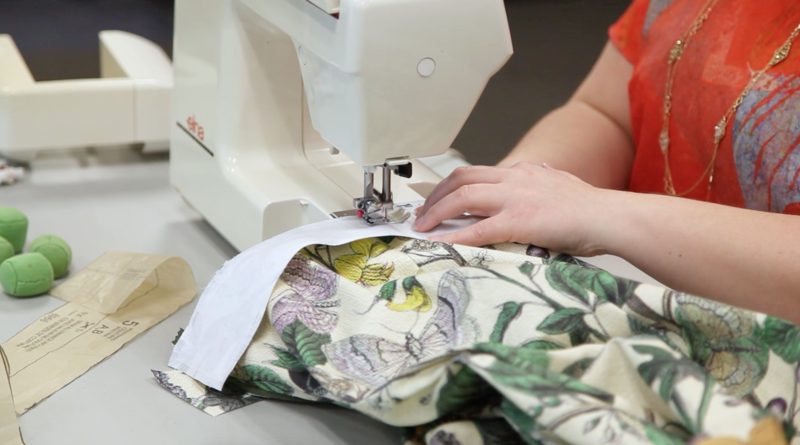 Attach the interfacing following the manufacturer’s instructions. Match up the raw edges of the waistband and the pants using your notches as a guide. Pin the waistband pieces to the pants. 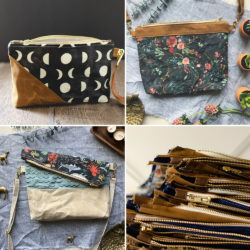 Sew everything together and press your seams. 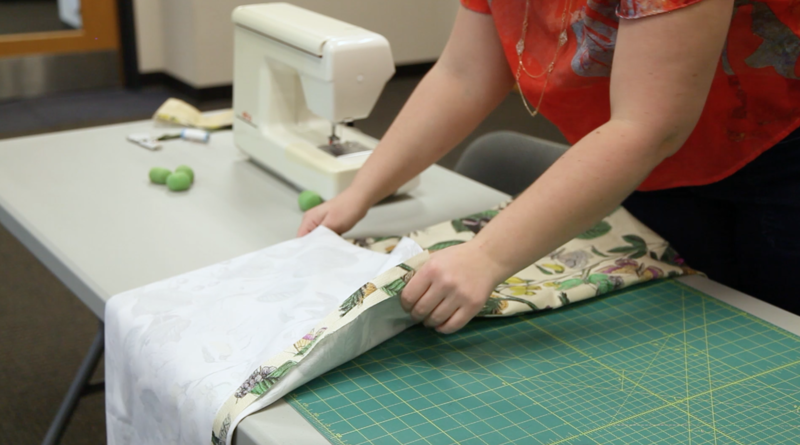 Press down a ⅝” seam allowance. Fold over again, matching up the fold line with the stitching. 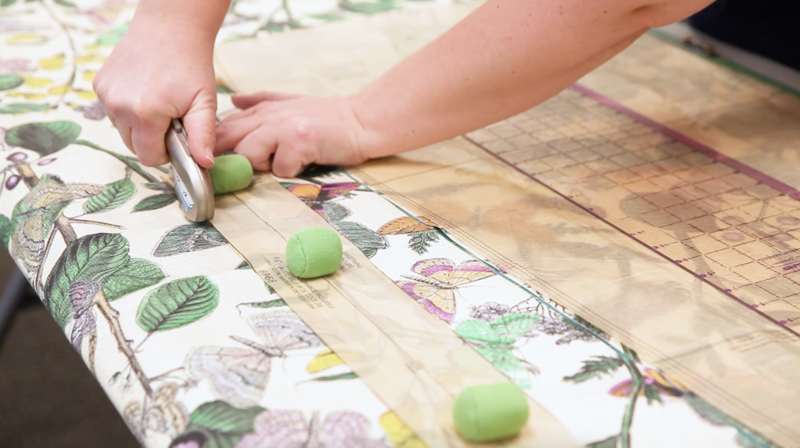 This next part is a little tricky but the video tutorial can help walk you through these steps. 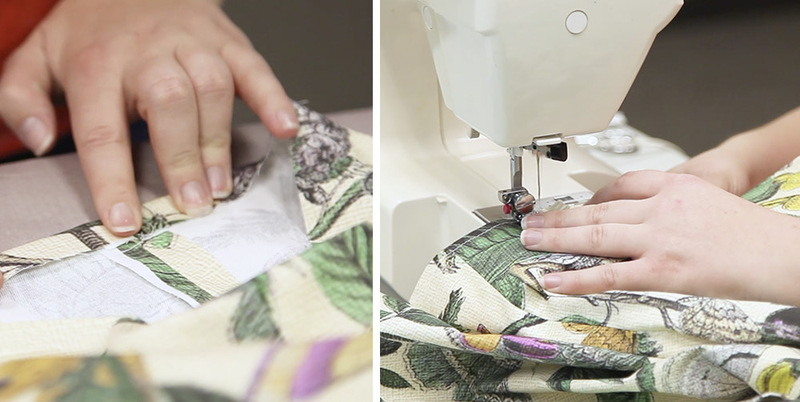 First, match the right sides of the waistband together and stitch with a ⅝” seam. 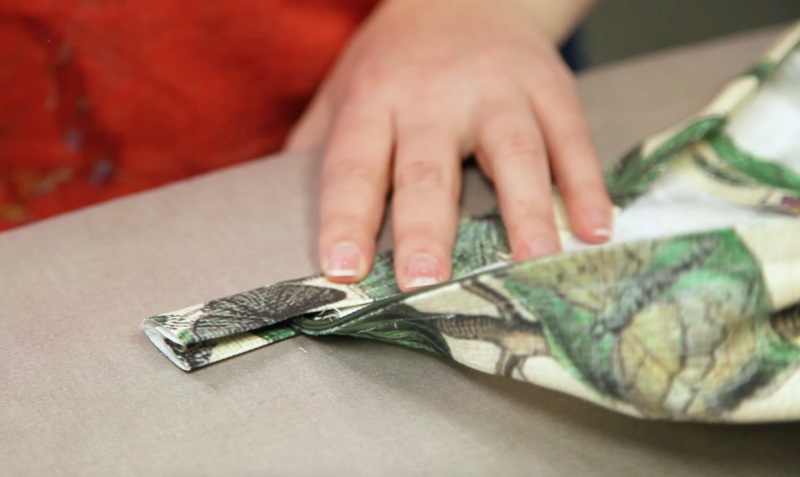 Trim the seam, clip the corner, and flip right side out. Now we have a nice waistband overlap for our button. Next, topstitch around the entire waistband. 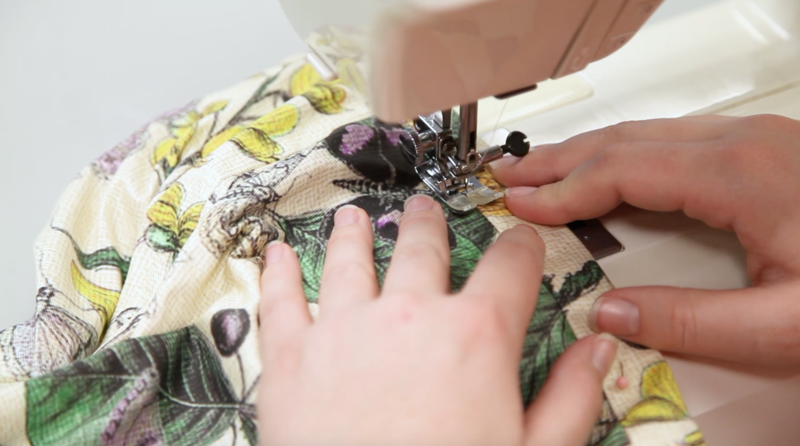 Switch to a buttonhole attachment, and sew a buttonhole in the pants. Seam rip the buttonhole open. Now we’re going to sew on our button. 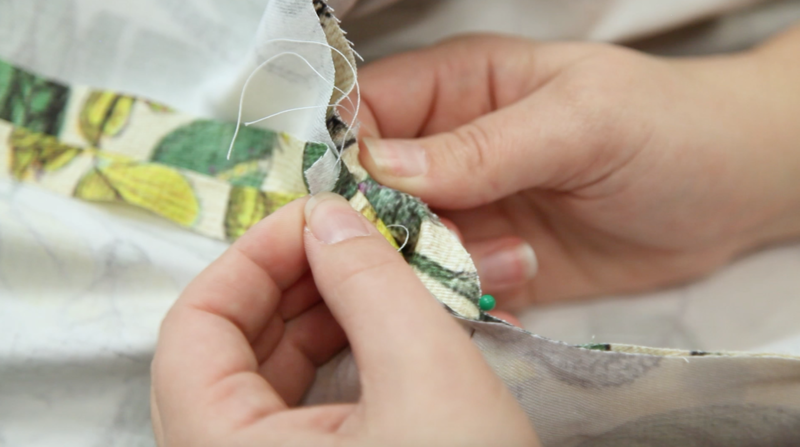 Use the buttonhole you just created to mark where the button should be sewn. 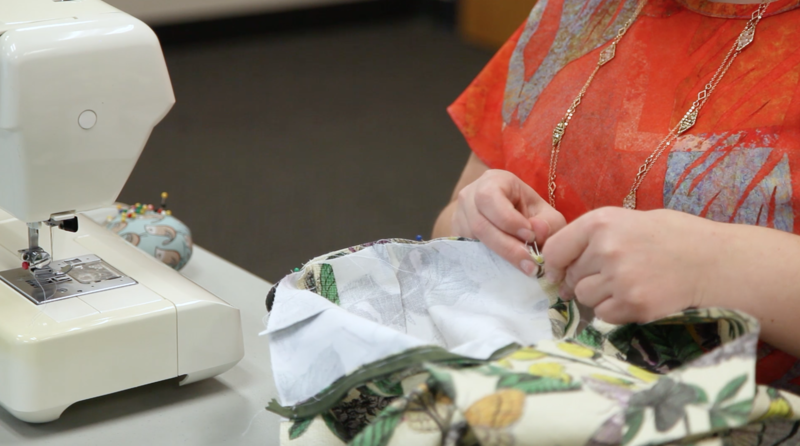 Pro tip: Place a toothpick or tapestry needle behind the button to create space for attaching the button. 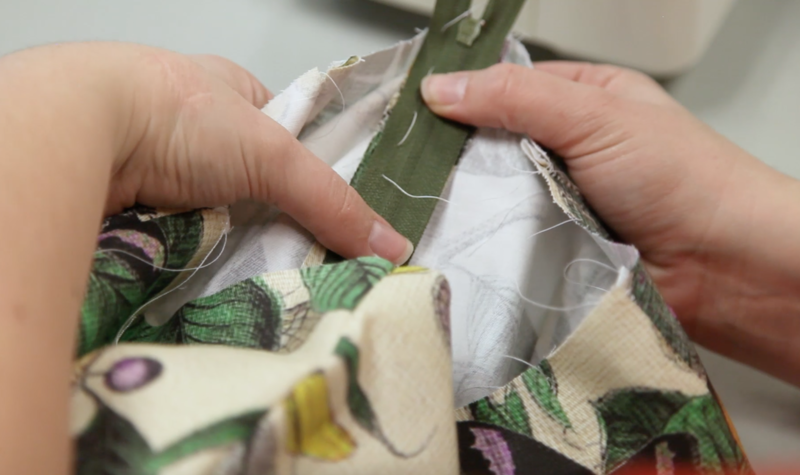 If the button is sewed flush against the fabric, you won’t be able to fit the waistband tab behind it. Fold the fabric up ⅝”, wrong sides facing. Turn under again, press with an iron. Stitch in place to finish your pants. 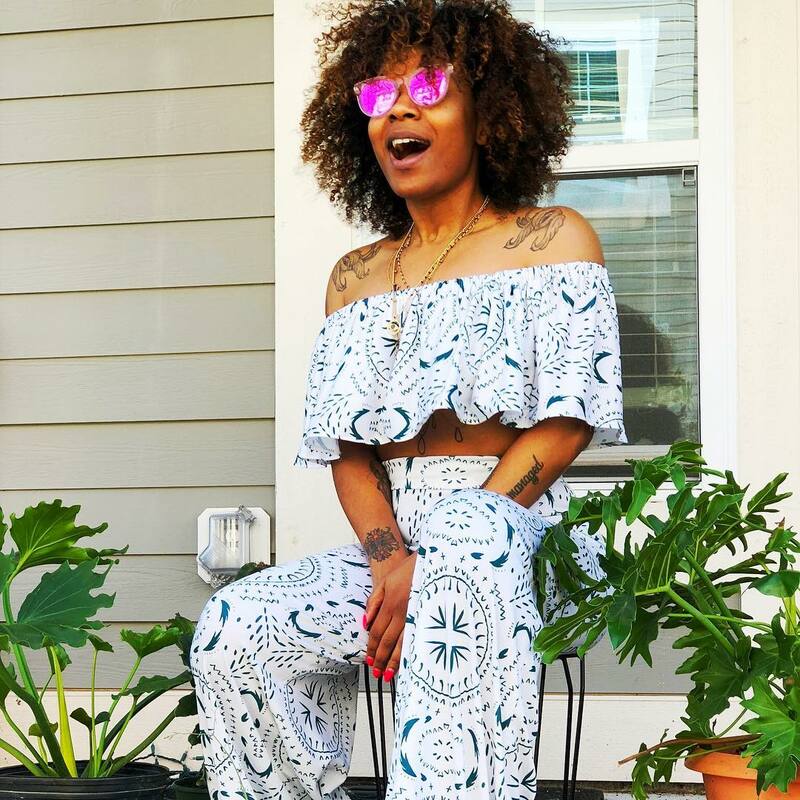 Your inner flower child will be ready to groove to the beat in these wide leg pants! 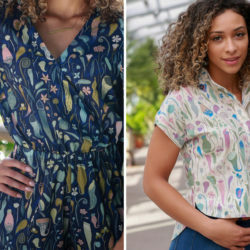 For a more casual version like below, switch out the Lightweight Cotton Twill for Modern Jersey in a boho-chic design like Mandala Marine Light by holli_zollinger. They are lovely! I am so honored you used my print! Your butterflies were perfect for the boho-vibe we were going for! I would love to see an actual, full-front and back photo of these pants. Lying on the ground and sitting in a chair, I don’t get the full effect of what you’re calling “wide”. I’d like to see a photo of the pants worn by someone standing up rather than sitting down. You can see the Modern Jersey version modeled by someone standing here. We apologize for the trouble! You can find the pattern for these pants here. We can’t wait to see your version! 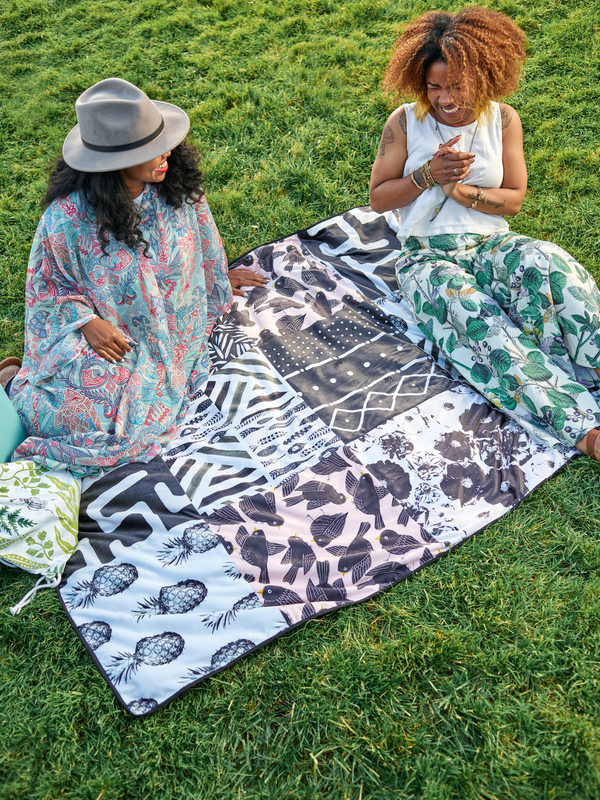 Love the blanket they are sitting on too! !